Every year, when we have a dry spell followed by heavy rain, the electricity supply to my house trips out and, almost immediately, comes back on, but not before causing my computer to restart. This year this happened 6 times in one day, losing me several hours work, and I firmly resolved (again) to get round to buying an Uninterruptable Power Supply. However, laptops use batteries and so are immune to short power interruptions, and by using a free utility called Synergy I can have a single working environment spread across two machines – two computers, two screens, one mouse, one keyboard, cutting & pasting from one to the other. 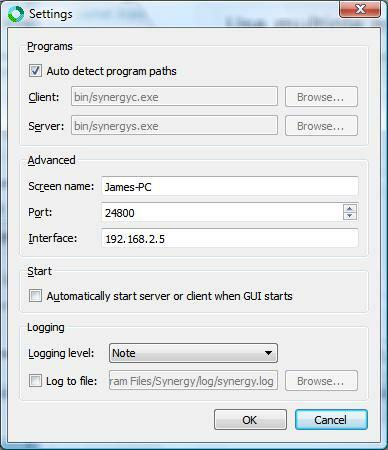 Download and install Synergy on both machines. Drag the picture of a screen in the top right hand corner onto the page, to a box to match the position of your laptop relative to your current computer screen. I had my laptop on the left of my desktop screen, so I put it in the box on the left. This controls the way the mouse moves around – off the left of the PC screen onto the laptop screen. It is put there as “Unnamed”. 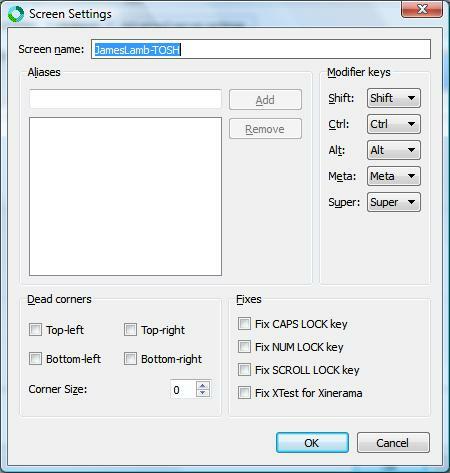 Double-click it and get the Screen Setting box. 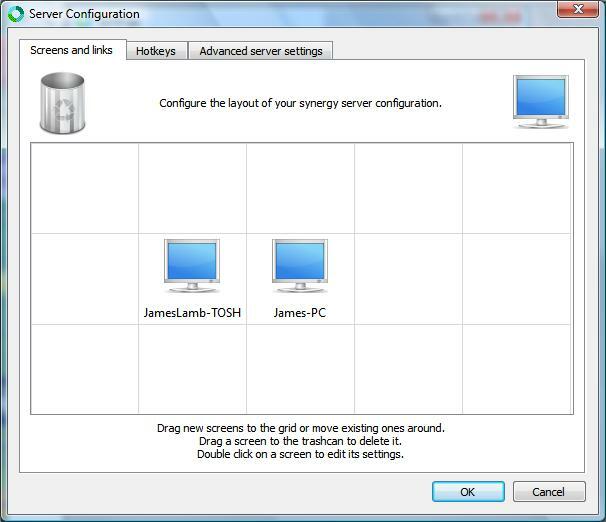 Change the name to match the other computers name, my laptop is JamesLamb-TOSH (as it is a Toshiba), and click OK, OK, to close both windows. In the Interface box enter the IP address of the current PC. 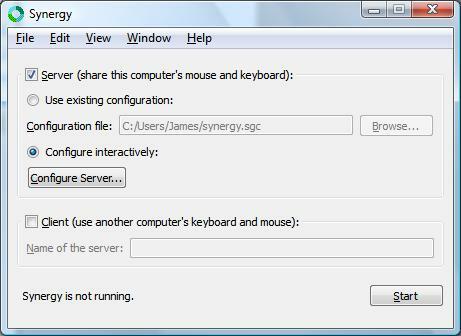 Now move to the laptop, install and start the Synergy window, and click “Client (use another computer’s keyboard and mouse)”, and enter the IP address of the main PC, the same IP address you found above. Click on Start, and the mouse pointer will disappear. Now go back to the main PCs mouse and keyboard, and move the mouse off the left of the screen, and, lo and behold, it moves onto the right hand side of the laptop screen. The keyboard now operates on whichever screen the mouse is on, and cut and paste work too – cut on one screen and paste on the other. Add Dropbox to both machines, for your working area, so that files you are using are accessible from both machines, and you are ready to go. Browse the web on one and work on the other, or put your indexing software on the laptop, and the PDF on the other. That way, if there is a power failure, you don’t lose any work because your laptop just switches to running on batteries. Sometimes when you move the mouse down into the bottom left of the screen to access the start button, or to the top right to hit the close window button, you will overshoot and switch windows instead. Synergy allows you to avoid that by designating certain corners to be ‘dead’, so you can’t switch screens there. In the Screen Settings window, you define how large the corner is by entering the number of pixels – I would suggest 50. You can use Synergy for more complex situations, even mixing Windows, Mac and Linux machines. There are still some situations where you need to use the laptop’s own keyboard, such as installing software, where the Windows installer locks down network access, preventing Synergy from operating, so don’t put the laptop where you can’t access the keyboard, but for normal working situations, it works so transparently you quickly forget it is there.